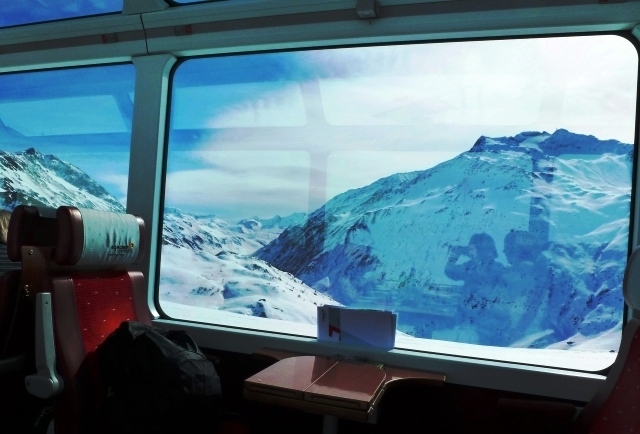 Exploring Switzerland by train has to be one of the best ways to see this perfect country. Yes, it has excellent motorways and roads but rail travel is a pleasure and often quicker than by car or coach. In winter a large area of the country is covered in snow, but unlike the UK, where a light dusting brings the country to a panicky standstill, Switzerland trains continue to run like clockwork, as you’d expect here. 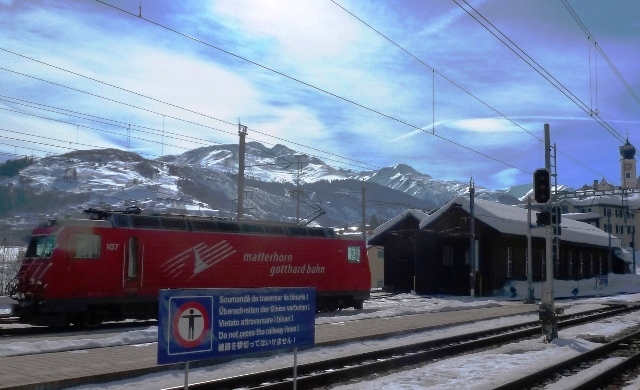 One of the most memorable rail journeys I ever did was from Carnforth to Interlaken then up the mighty Jungfrau on its tiny 100 year old train, on the luxurious Glacier Express to Saint Moritz and finally on to Zurich. There was snow everywhere, the sun shone nearly all the time and picture-postcard scenery surrounded us on all sides. Here is how I did this spectacular railway journey through some of the most impressive scenery in Switzerland. 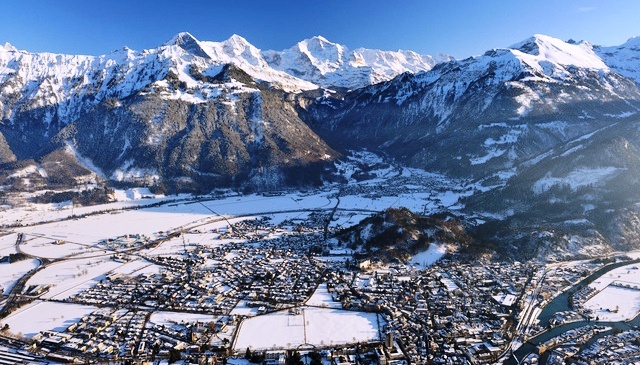 Interlaken was once a popular health resort for the rich Europeans, situated between the lakes of Thun and Brienz. Lord Byron stayed at the Hotel Interlaken (in 1816) as did the composers Mendelssohn and Schumann. 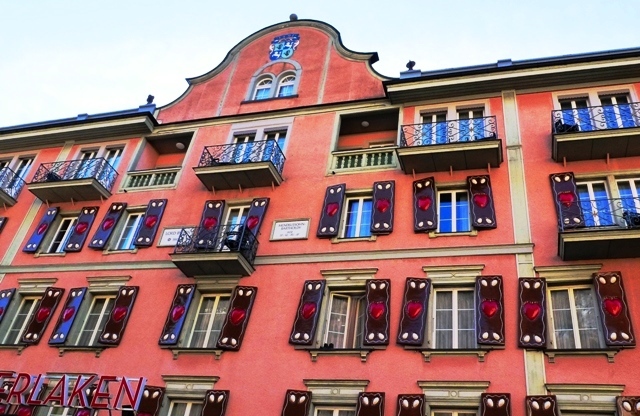 British visitors put it at the heart of the Swiss tourist map in the early 20th century and that legacy can be seen in the big old hotels that can be found around the town. Embraced by jagged mountains, with a wide open meadow to preserve the view, the Jungfrau towers over Interlaken, enticing all to ascend its peak. From Interlaken Ost you can take a circular route up to the Jungfrau. We left the lakeside city in one of the distinctive yellow and blue carriages of the narrow-gauge Bernese Oberland Bahnen (BOB) and tootled off between the lakes and up through the attractive Lauterbrunnen Valley. I took photos from the train, as the scene became more Alpine by the minute. At Lauterbrunnen Station we crossed the platform to join the Wengeralp-Bahn (WAB) train and off on the narrow rack railway that winds its cheery way up to Wengen, a busy ski resort at 1274m. The most spectacular piste of the region is without doubt the Lauberhorn piste near Wengen, popularised by the World Cup. There are no roads up here so all the trains are equipped to take skis, snowboards, equipment and luggage. As we climbed ever higher the imposing Bernese Alps loomed over us. As well as the monastic Monch (Monk) 4,099m and splendid Jungfrau, 4,158m. we got a fantastic view of the 3,970m Eiger from the Jungfrau train. At Kleine Scheidegg 2,061m, magnet for skiers, walkers and mountain climbers drawn by the lure of the high Alps, we transferred to the historic Jungfrau-Bahn (Jungfrau Railway) with its quaint wooden carriages. The building of the world’s highest railway line and station was a 19th century masterpiece of logistical planning and construction. It opened on August 1st, 1912 and has to be one of the great railway journeys in the world and the jewel in Switzerland’s railway crown. We were fortunate to be there in the centenary year and caught a glimpse of the original 100 year old train from the window. After trundling up the steep mountain track we entered a very long tunnel (7,122m) with enormous viewing windows. 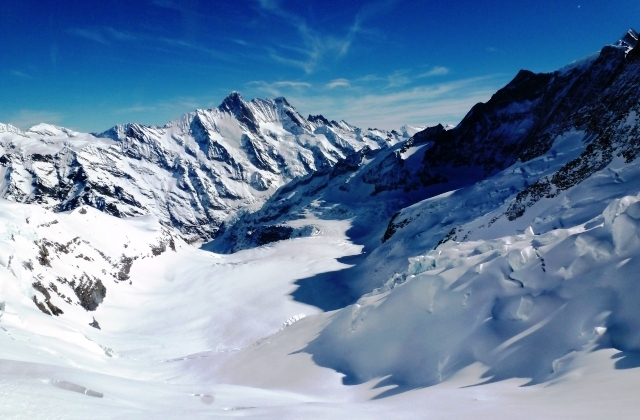 Everyone got out at the Eiger Wall for a fantastic view of the famous North Face and then at Eismeer (Sea of Ice), where the glaciers of Grindelwald and Fiesch flow in sinuous icy splendour. The Jungfrauhoch station, hewn from inside the mountain, brings a frisson of excitement as people disembark into the heart of the mountain. 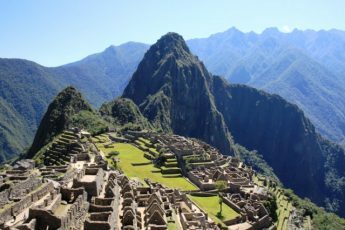 I immediately felt the impact of the altitude as breathing became more difficult and walking was like trudging through treacle. Cut into the glacier is the Ice Palace, with impressive ice sculptures.Lifts take passengers to the Visitor Centre with its Information Centre, cinema, art gallery, shops and restaurants. Once we had acclimatised we went outside up to Viewing Platform and the Sphinx International Research Station. Apparently Europe’s highest grid-connected solar power plant is situated here too. Icy fresh air cleared our lungs; it’s cold up on the top all year round so warm clothes are essential. We were lucky; there can be cloud up here so if you are planning a visit do check the visibility. 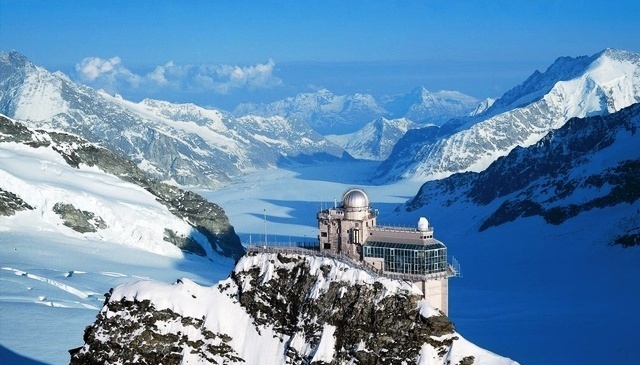 We got marvellous views of the mountain tops and UNESCO World Heritage Jungfrau-Aletsch National Park. The return journey took us back via the cosmopolitan village of Grindelwald, the largest ski resort in the Jungfrau region, surrounded by a commanding mountainscape with the Eiger North Face and the Wetterhorn. 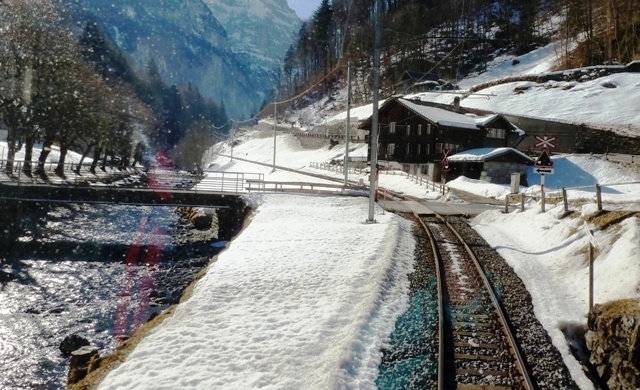 Returning to Interlaken is to come back down to earth after being in another world, where railways and nature combine to give visitors “one of the most sensational experiences in Switzerland” Switzerland by Train – JMP Guides. 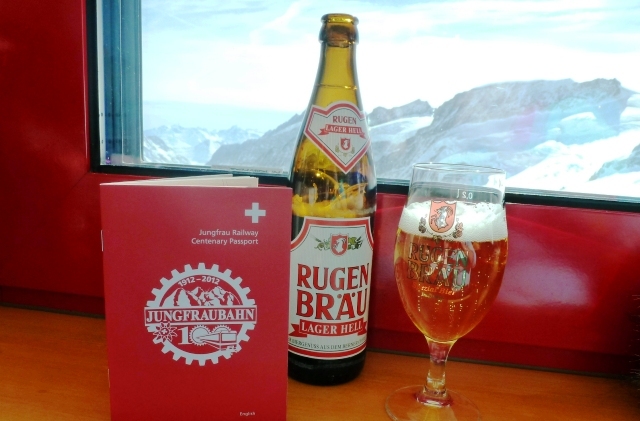 This journey from Interlaken to the Jungfrau is detailed in an excellent book for all railway fans ‘Great Railway Journeys of Europe’ Insight Guides. I travelled to Switzerland with Railbookers, providers of quality railway and train tours around the world. We love a train trip, and this sure looks like a great one! I did this trip in the winter but my son went up the Jungfrau in the summer with Scouts when they were staying at Adelboden. He said there was still a lot of snow at the top though he didn’t get quite such clear views as we did. What gorgeous photos of the mountains! 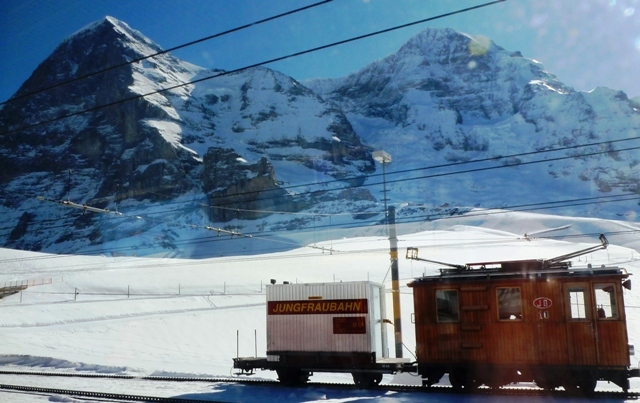 I love trains and riding a 100-year-old train up the Jungfrau must be one of the top rail journeys in the world. Went up the Jungfrau with Scouts a couple of years ago. It was very cold and felt weird but I like the views. Yes, the views are great (and that weird feeling doesn’t last when you get used to the altitude!) and the journey up is really spectacular too. 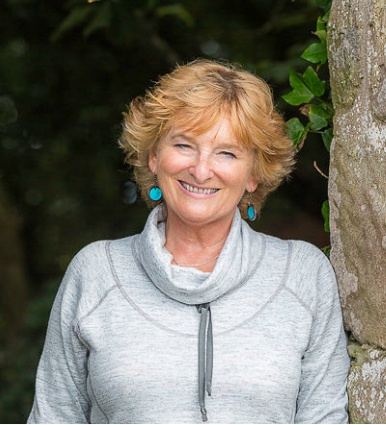 Do hope you get to do that trip one day Lesley – sure you will love it! OH WOW!! I was in Interlaken, and was curious how it looks in winter. This is stunning, it is so different. It literally looks like a complete different place! Keep up the lovely work, I love the photos, and the style!! Glad you enjoyed the article Matt and thanks for leaving the link to your post. It’s good to see a budget option for this expensive part of the world!